Born into a former bastion of Puritanism and descended from prominent leaders of that faith, Hawthorne structured so much of his fiction upon issues related to New England Calvinist theology that he and his environment appear inseparable. While not a regular churchgoer himself, Hawthorne wrestled passionately with the religious fundamentalism of seventeenth century Massachusetts as well as its more secular manifestations in the nineteenth century. Hawthorne's Salem was drenched in history and religion. 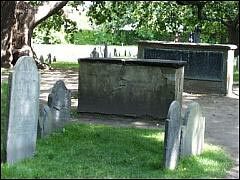 He met Sophia Peabody, the woman who would become his wife, in a house directly adjacent to the Charter Street Burying ground, the final resting place of some of his ancestors, including the notorious John Hathorne, one of the judges at the witch trials of 1692. The very fireback used in the sitting room of what is now known as The House of the Seven Gables, once the home of Susan Ingersoll, one of Hawthorne's relatives, depicts a scene from the Genesis tale of the fall of Adam and Eve. It would have been impossible for any sensitive and intelligent person growing up in Salem in the first half of the nineteenth century to have escaped either a sense of the past or the influence of Salem's religious milieu.